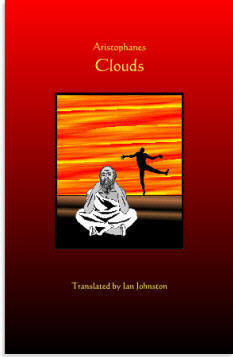 The comic drama Clouds (423 BC) is one of the most famous and popular satires ever written. In it Aristophanes, the greatest comic dramatist of ancient times, takes issue with the intellectual and moral depravity of his fellow Athenians, particularly with their thirst for radical innovations in traditional ways of thinking and for their unscrupulous self-interest. The play is particularly famous for its portrayal of Socrates, the target of much of the very robust satire. Here, he is pictured as a caricature of the arch sophist, eager to earn money by training young Athenians so that they can successfully use corrupt notions of language, law, and just dealing to their own advantage. The portrait is clearly at considerable odds with what we know about Socrates from other sources; nonetheless his character here is very famous as an unforgettable picture of a sly intellectual rogue. The Athenians come in for their share of humorous satiric criticism as well, given how greedy they are to use people like Socrates to escape unwelcome obligations. Aristophanes obviously exaggerates considerably for comic effect, but the ominous tone in the play's ending reminds us that some years later these citizens turned against the historical Socrates and condemned him to death. Ian Johnston's new verse translation of Aristophanes' Clouds stays close to the original text yet offers an accessible and fluent English version, which conveys the full range of Aristophanes' style - ribald humor, lyric expressiveness, and underlying ironic seriousness - in a text full of dramatic energy. The translation also offers explanatory footnotes to assist the reader with any potentially confusing references.